If you’ve ever driven down Euclid Avenue in East Cleveland, you may have noticed a diamond in the rough hiding on the south side of the road in between Peter Pan Donuts to the east and an abandoned apartment complex to the west (between Wymore and Rosemont.) This was the home of a man by the name of Theodore Arter. It was designed by Knox and Elliott who designed many homes and commercial buildings both in and around Cleveland at the beginning of the 20th century. Arguably at the top of their credits, Knox and Elliott designed the Rockefeller Building downtown, as well as the Hippodrome Theatre. According to A History of Cleveland and its Environs: The Heart of new Connecticut, Volume 2, Theodore Arter was born in Hanover, OH in 1833. In 1870 he became an oil refiner and within a few years he began work as a timberman and stave contractor with the Standard Oil Company. It’s approximated that he worked for Standard Oil for a total of 38 years. This residence was built in 1899 according to the Cleveland Landmarks Commission, which means that he would have only lived there for ten years. At that point he then moved back to Yonkers, NY and just five months later, at the age of 77, passed away. He is buried in Lakeview Cemetery here in Cleveland. The last recorded resident of this structure by the Cleveland Public Library’s necrology file, was Anne E. Hager who died in 1957. Looking at the auditor’s website, the property has gone through many hands since 1975, and mostly through the hands of various banks and mortgage companies. The current owner, Stanley Appleton, bought the property in December 2003 for $21,500. Six years later there is no evidence of a desire for improvement on this property. How could this property potentially be reused and restored to its former glory? When I think about this, what comes to mind is a current project on East 105th St. at the foot of the Veterans’ Hospital called Heritage Lane. There is a long line of lovely old homes there being restored in an effort to revitalize the area as well as encourage a more sustainable lifestyle (i.e. live, work, and play locally) for the employees of University Circle. There is also a long line of lovely old homes and structures that need to be restored and cared for, starting with the Theodore Arter residence leading all the way up to the new Circle 118 properties, including #13204 Euclid Avenue, which (according to the realtor) is said to have been the home of Rockefeller’s sister, now for sale at $159,000. I can only speculate about the future of Mr. Arter’s residence as well as the others along that strip, but we can’t deny the attention to detail that Knox and Elliott put forth when designing Mr. Arter’s residence. Terrific. Never noticed it before. I was just about to post that I was going to work on a companion piece (1825 Rosemont by Knox and Elliott) but now that I am looking at the auditor's website, the address doesn't show up, which is never a good thing. I'll have to buzz over and take a look for myself. I loved this post as I'm making a screen saver file of historic buildings on East Cleveland's Euclid Avenue. I was looking for a photo of the historic Arter house. Euclid Avenue in East Cleveland is my favorite historic stretch in our area. It's like a time capsule. That's what all of Euclid Ave. looked like 100 years ago with the billboard scaffolding on tops of buildings and the other architectural details long removed in the name of progress. And by the way it's not hearsay that 13204 Euclid Ave. was the home of Rockefeller's sister Mary Ann Rockefeller Rudd. 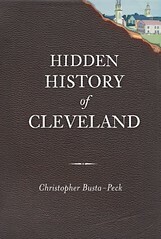 Built in 1901, the home is mentioned on page 498 of A History of Cleveland and Its Environs, available full text on Google books.